Synopsis: This article helps you avoid error “Invalid stage transition. Transition to stage <stage name> is not in the process active path.” by suggesting some best practices for automating stage progression in business process flows. 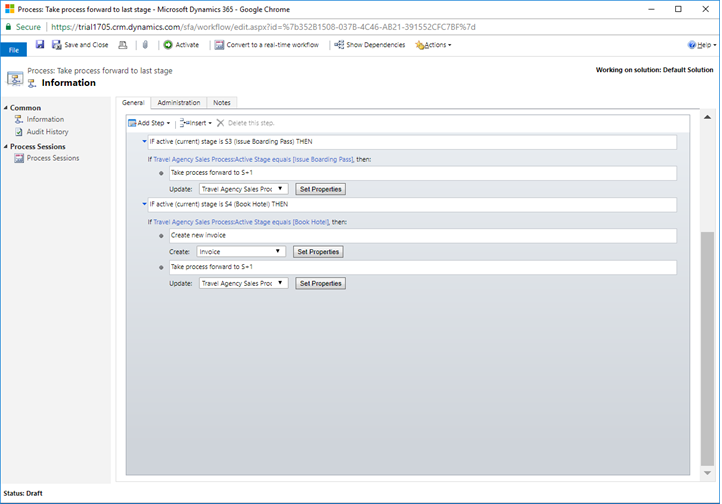 The Fall 2016 release of Dynamics 365 (version 8.2) introduced big enhancements to business process flows, enabling a number of important customer scenarios (including Concurrent business process flows and Business process flow automation) that we captured on CRM Ideas, conferences and community meetups since the introduction of this feature. To learn more about Business Process Flows in Dynamics 365, see Business process flows overview. In versions of Dynamics 365 prior to the Fall 2016 release (8.1 and prior), organizations that wanted to automate their business processes relied on a few work-arounds, most notably the need to force values on the ProcessID, StageId (active stage) or TraversedPath attributes. Frequently, these techniques would fail with either an error message or a displaying a broken process control. However, there was a small but not fully determined subset of cases where these techniques would appear to work. These techniques would not present obvious visual glitches or error messages, but would typically result in corrupt data in the database. In all of these cases, Microsoft has maintained that programmatically manipulating the business process state is not a supported scenario: neither the front-end web control or the underlying infrastructure have the necessary logic to handle stage skipping, which was not part of the original design. Important: The key rule to keep in mind when modelling successful business processes is that the business process flow functionality in Dynamics 365 is not a representation of a state machine, but rather of a linear flow whose natural progression is always forward towards the end. The problem with modelling a process as a state machine is that it requires long stage jumps. Often, though, it’s possible to model alternate paths by taking advantage of branching. The two previous scenarios can be solved in a safe and supported way by taking advantage of the existing functionality in Dynamics 365.The third scenario we want to cover is not a supported scenario, and is currently in this product’s feature backlog. Customers interested in exploring it should vote and add scenarios to this entry on CRM Ideas. Using Dynamics 365 Workflow, the following logic takes the process forward to the final stage (Prepare & Send Invoice) if it’s on either the third or fourth stages. Using the Client API, the moveNext and movePrevious functions manipulate the active stage of the process. They take a callback function with single argument representing the result of the operation. These functions always apply to the process rendered on the process control. To switch to a different process, call getProcessInstances to get a list of processes associated with the current data record, and pass in the ID of a process instance to the setActiveProcessInstance method to bring it to the foreground. Existing Business Process Flow automation logic may fail on Dynamics 365 after the upgrade to the Fall 2016 release (from version 8.1 or earlier to version 8.2). This behavior is by design. Most existing automation logic relies on forcing values to the ProcessID, StageId (active stage) or TraversedPath attributes of a data entity, but the Business Process Flow components are not designed to handle arbitrary or long stage jumps like a state machine. Cases that appeared to work on previous versions of Dynamics 365 without visual glitches or error messages, but resulted in corrupt data might fail after the upgrade. To avoid issues, stage custom solutions and automation logic before committing to the upgrade, using a sandbox environment and making sure to perform a full test pass. It may be necessary to replace stage jump logic with stage-by-stage automation or branches.